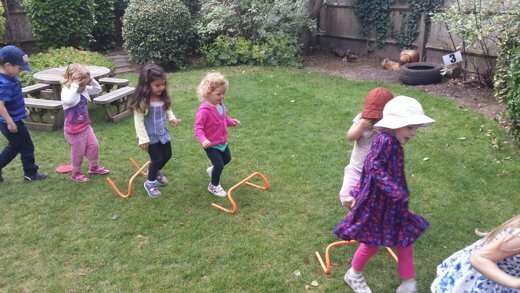 We work in partnership with nurseries to bring Activ8 sessions to children in their care. Our sessions are fun, engaging and physical, and are designed to promote an enjoyment of keeping active at a young age. We encourage participation, expression and co-operative play, all the while helping children learn skills which will underpin the foundation of their physical education. Our nursery sessions are planned by a qualified early years teacher and sports coach and follow the EYFS, particularly physical development, but also linking into communication and language, and personal, social and emotional development. Activ8 recognises the unique child principle, and helps provide an ongoing and half termly assessment of the skills and achievements of every child. Every child receives a certificate, personalised to show their key achievements and targets for future development. We encourage children’s individuality and provide adult led and more unstructured, child initiated activities, as part of our classes. You can learn more by contacting us, or book into our Busy Bees session (Tuesdays 9:45 – 10:30) below.